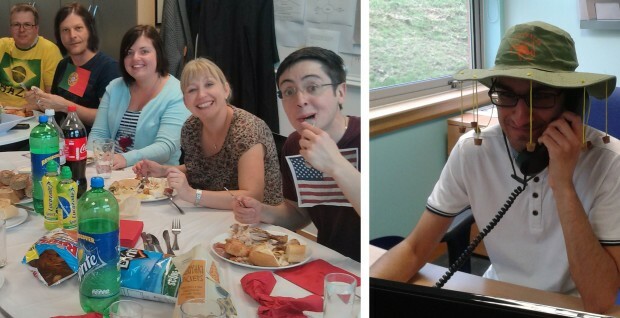 Here at Stockdale Martin we admit that we’re not that into football, but we love different cultures, particularly their food! Today at lunch, to get in the spirit of the World Cup, we had a “World Cup buffet”. Each team member brought in a food from a different country in the World Cup, which resulted in a very flavoursome feast. We had Nigerian chicken, Spanish tortilla, French cheeses, German Sausage, Salpicao (Brazilian chicken salad), “Kangaroo”, Belgian Waffles, Swiss almond cake, Wasabi, tacos… and more (we’re very full now)! We also dressed up for the occasion. Amar definitely wins the prize for best costume with his authentic Australian hat which he’s been wearing to answer the front door all morning! Here’s hoping England will win tonight… what’s your prediction for the match?